Cooking In College Means More Than Making Ramen Every Meal! If you think meals made in dorm rooms consist of Ramen noodles and nothing else, you’re not letting your culinary abilities shine! (Although if you do want to make Ramen, we suggest the Rapid Ramen Cooker.) While dorm room regulations don’t permit some cooking appliances, you can still make some creative meals with a variety of cooking appliances for college. If you’re hoping to make a hot meal but don’t want the same old cafeteria food, there’s more than just microwavable meals at your disposal. Eggs are a quick-meal staple as well, and since you won’t have a stove, try out the Rollie– Easy Egg Cooker. This electric cooker is fully enclosed, meaning it’s safer to use and should be permitted in most dorms, but always check with the appropriate staff first. 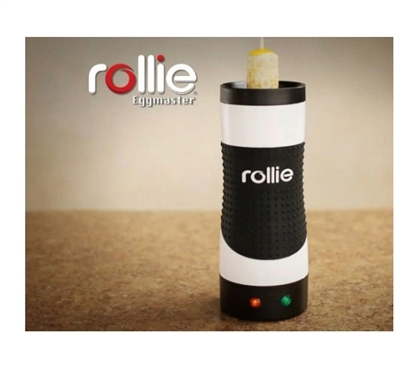 This vertical cooking tube makes scrambled eggs a no-work breeze to make! Or, you can get creative and try making cinnamon rolls and other college snacks you wouldn’t have thought possible! If you’re looking to take a more traditional route, include a Hot Pot as part of your college supplies. Hot Pots are staple dorm room supplies, and they’re useful for making a quick cup of coffee or tea, or even for making pasta or Easy Mac. Since hot pots only heat up water, they’re typically not a dorm item on the dorm supplies checklist of items not permitted in dorms. A hot pot is an essential for college and will come in handy more times than you might think. Ok, so having a bowl of cereal isn't exactly cooking, but that doesn't mean that won't count as the go-to anytime meal in college. If you'll be eating plenty of cereal, might as well make it as enjoyable as you can, and to do that, add the Deluxe Cereal Container Kit to your dorm shopping list. This cereal bowl isn't just some regular old bowl for meals. It's compartmentalized to provide maximum crunchiness for your cereal. This deluxe cereal container kit is great for on the go meals- the freezer gel lining helps keep milk cold for up to four hours so when you're in a hurry or need a snack, it will be the perfect no fuss item that saves you money from not going to vending machines. Since you’ll have to resort to the microwave for some meals, it is best to have a variety of microwave bowl sizes for breakfast, lunch, dinner, or a small snack with the Microwave Pots- Set of 3. With three sizes of bowls with matching lids, these microwave pots won't take up much valuable space as they can be easily stacked and they will be perfect for heating leftovers!our dorm shopping list. This cereal bowl isn’t just some regular old bowl for meals. It’s compartmentalized to provide maximum crunchiness for your cereal. 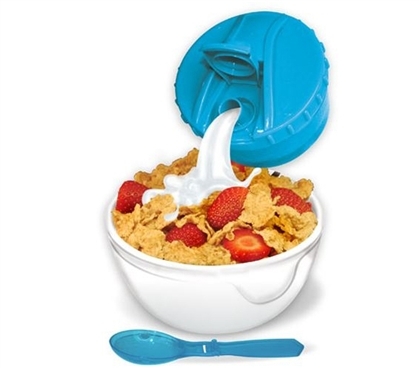 This deluxe cereal container kit is great for on the go meals- the freezer gel lining helps keep milk cold for up to four hours so when you're in a hurry or need a snack, it will be the perfect no fuss item that saves you money from not going to vending machines.